AD: Thank you for your interest in my book and your invitation to discuss it. I started reading Bonhoeffer’s Discipleship in high school and his Ethics at Wheaton College. His sacrificial vision of Christianity and his courageous action in the face of Nazi totalitarianism deeply inspired me. Nonetheless, I wrote an ambitious dissertation proposal in which Bonhoeffer had no role. I entitled it The Archeology of Ethics and the Constitution of Creation: On the Concept of Beginning in Genesis, St. Augustine, Hannah Arendt, and Deep History. I laugh now, because that project was at least four dissertations. Then my beloved advisor, Jean Bethke Elshtain, passed away on August 11, 2013, and this proved to be an opening salvo of grief in my life. Soon after, my mother had a severe stroke; a close friend’s mother died of breast cancer; my mentor’s wife suddenly died of heart failure; and my marriage went through a season of intense pain. Meanwhile, I was practicing universal entry, which I’ll discuss below. The question of new beginnings – the interrogation and hope for them – became extremely personal to me, again, and Bonhoeffer remained an important inspiration. Back to August 2013, I wrote an email to Professor Charles Mathewes asking for advice on my dissertation. He wrote back and asked, “Have you read Bonhoeffer’s CREATION AND FALL?” It’s amazing to me how a simple question can change our lives forever. It’s also amazing how we can love someone so much, and yet not put them at the center of our work. Chuck’s email flipped a switch, and within a few weeks, I had decided to abandon my original project to write on Bonhoeffer’s ethics of new beginning. I’m deeply grateful for Chuck’s guidance. More so, I’m grateful for the exceptional guidance of my final advisor, Professor William Schweiker. His ability to listen to my ideas, clarify them with prescient questions, and then provide empowering direction (especially my book’s focus on capacity, justification, and practice) astonished me. Bill’s generous leadership allowed my work to make a new beginning after Professor Elshtain’s grievous death, and illustrates for me Bonhoeffer’s principle that new beginnings can be hidden in our apparent endings. As an aside, I’ll never forget reading the final lines of the final volume – a gut-wrenching letter from his parents that he never answered because he was transferred to another prison and then executed. Of course, I had known exactly how Bonhoeffer’s story ended since high school. But getting to those last words was like nothing I have ever experienced as a scholar. I sat at my desk in a daze – grateful for his life, grieving his death, saddened that our year-long conversation had come to an end, wondering how anyone could kill such a beautiful human being, and passionately determined to write a comprehensive study of Bonhoeffer’s thought on (1) the human (in)capacity to make new beginnings, (2) justification and guidance for new beginnings, and (3) practices of new beginning. And that’s what I did. As a younger scholar, it has been extremely encouraging that established scholars I respect like David Gushee, Jennifer McBride, and Victoria Barnett have called the book groundbreaking, prodigious, and some of the best work on Bonhoeffer in the last ten years. More broadly, Bonhoeffer was the right choice for my research on the ethics of new beginning for at least three reasons. First, Bonhoeffer was not an idealist or naïve optimist. If we are going to talk seriously about new beginnings, we must reckon unflinchingly with the reality of horrific evil and devastation. Nietzsche made this point very fiercely: most of us are not willing to stare into the face of the world and the human condition, because it terrifies us, and we don’t have the courage for an uncensored encounter with reality. But Bonhoeffer did. Second, Bonhoeffer nevertheless possessed a radical hopefulness precisely as he looked into the face of evil, which I find extremely inspiring, prophetic, and urgently needed today. While there is no escapism in Bonhoeffer, there is also no cynicism or defeatism in him either. Through it all, Bonhoeffer believed in the goodness of God, the faithfulness of Christ’s promise to renew all things, and thus the defiant witness of new beginnings. His final recorded words before he was hanged – “This is for me the end, but also the beginning” – capture his sensibility and appear to have been a personal mantra of sorts. I document this in the appendix to my book. Hope is the spring of human life, and Bonhoeffer is a profound witness to it. Third, Bonhoeffer was a thinker but also a practitioner. Of course, the question of beginnings is extremely profound on the theoretical level, as any reading of Plato, Augustine, Kant, Hegel, Mann, Arendt, or Bonhoeffer himself makes clear. But I believe the question of (new) beginnings is fundamentally a practical moral question: Can we make a new beginning? If so, which one, and why? If not, then what? Bonhoeffer’s thought directly engages these urgently practical questions about how we should live as creatures who ask about our beginnings and seek new beginnings today and tomorrow and at the limit of human existence – death itself. Bonhoeffer’s commitment to practicing and living his ideas, especially in such a catastrophic period, was extremely important to me. Q: Two seemingly simple, and yet profound questions operate like a melody line throughout your book: “Is it good to exist?” and “Should life in the world with others be loved without exclusion?” At first blush, these can seem like fairly straightforward questions. However, as you detail in your book, that is far from the case. What problematizes potential answers to these questions—particularly in today’s context? AD: It’s important to recognize the uniqueness and profundity of these questions when thinking about what it means to be human. Philosophically speaking, all things that are exist (metaphysics). Moreover, some of the more complex forms of life have some knowledge of their existence (epistemology). But it is a uniquely human vocation to interrogate whether it is good to exist and thus whether life in the world should be loved (ethics). All things exist, and some things know it, but only humans can make a judgment about whether being alive in the world is worthy of love or hatred or indifference. Amidst our experiences of joy and grief, justice and violation, community and loneliness, life and devastation, we want to know if it is good to be alive, if it should be cherished and committed to as a gift or only endured as a given or abandoned as a burden or actively attacked as a curse. Camus said that “to breathe is to judge.” His point was that the fact that each of us has not committed suicide, which is also a uniquely human capacity, indicates that we have made a judgment, implicit or explicit, that it is better to be alive than to kill ourselves. But this begs the questions of why we believe this and what the ethical implications are for how we live. These questions are even more challenging when they are universalized to include all people in our moral consciousness: “Is it good to exist, and should life in the world with others be loved without exclusion?” Some people may look at their lives and straightforwardly judge that they “have it good” and “can’t complain,” so, sure, “love it.” But what happens when others and their horrific suffering and devastation are brought into the question and our circle of concern, especially in our globalized world in which we have 24/7, worldwide access to human injustice and misery? In Addis Ababa, there is a large roundabout called Mexico Square. It’s a major junction in the city and a place where some of the most desperately poor and maimed people beg. One day, I saw a very old woman begging for help in the name of God. Her one eye was blind. Her other eye had been ripped out of her eye-socket and was cocooned on her emaciated cheekbone. She was all alone in a river of people rushing by her as she cried out for help. A year later, I was back in Addis and walking through Mexico Square again, and I couldn’t believe my eyes. That poor woman was still there, all by herself, begging for help, just like she was the year before. And then it hit me with incredible force: each day, each hour, each moment of the last year of my life – wherever I was, whatever I was doing – she was more than likely sitting alone desperately begging for help in blindness, aloneness, humiliation, and extreme poverty in Mexico Square. And it didn’t matter whether she was 7,000 miles away or right next to me; she exists, I know it, and her life matters. That recognition got me asking questions that intensely arrested and disturbed my consciousness. If she is just as valuable and worthy of care as myself or my beloved mother, can there be any real joy in clear eyesight, delicious food, safe dwelling, and loving community – when she is subjected to such misery? In all of those experiences, I know that the woman in Mexico Square is suffering and deprived of most, if not all, of the goods I enjoy. So, are these goods really good if, to enjoy them, I must ignore or even actively expel the sufferings of this woman from my moral consciousness? Can you sit in a nice restaurant with dear friends and a tasty meal and actually declare, “This isgood!” when you know that she is simultaneously endangered, alone, and hungry? But, of course, the problem is far worse. First, the woman in Mexico Square represents tens of millions of fellow humans who live their lives in abject misery. Researchers estimate that there are around twenty million slaves in the world today. Or look at Syria or Somalia or parts of the Southside of Chicago. I tell some of these stories in the first chapter of my book. Second, the moral questions I mentioned above can be asked in every moment of our lives, not just at nice restaurants – while studying, working, playing, grocery shopping, watching a movie, trying to fall asleep at night. Again, is it good to exist and should life in the world be loved when this “goodness” and “love” are contingent upon overlooking or excluding our most devastated sisters and brothers? What kind of authentic goodness and love is predicated upon and only sustainable by radical privilege and exclusion? But giving access in our minds to the realities of other people’s lives opens us to a cataclysmic tidal wave of injustice, grief, and potential nihilism. If we embrace what I call “universal entry” – this exercise of allowing others like the woman in Mexico Square to find a home in our moral consciousness rather than screening them out – it is anything but obvious that it is good to exist and that life in the world with others should be loved. And thus our ethical consciousness, which is so constitutive of our humanity, is critically problematized and even shattered. Even goodness becomes a “demented icon” of evil. When we really grapple with universal entry, suicide takes on a new seriousness. And for me, this raises the fundamental problem of new beginnings: something is terribly wrong with ourselves and our world; can we start over? Can our fundamental convictions that it is good to exist and that life in the world with others should be loved without exclusion be resurrected after they have been crucified by an honest confrontation with reality? That’s the gravitas of what my book is wrestling with. Q: Many people that are familiar with Bonhoeffer’s life and work may not be as familiar with the other thinkers in your book. How do the four philosophers you put Bonhoeffer in conversation with, Friedrich Nietzsche, Hannah Arendt, Jonathan Glover, and Jonathan Lear impact your reading of Bonhoeffer? First, each of these thinkers was, or still is, a nonreligious philosopher, so they immediately introduce a different point of view. I didn’t want my book to be a Christian echo chamber. Second, each of them grapples with the enormity of (real or imagined) evil and devastation. Nietzsche’s whole philosophy is constituted by the claim that human existence and, indeed, the universe as a whole is driven by “the will to power and nothing more” – the rapacious desire to conquer and consume others. Arendt wrestles with “radical evil” in the ruins of the Holocaust “after all hopes have died.” Glover painstakingly documents a “moral history of the 20th century,” guiding the reader through its most terrible conflicts and genocides and estimating that one person was killed in war every thirty seconds (!) of every minute of the last century. Lear examines the “cultural devastation” of the Sioux Indian tribe after the American government conquered and relocated them to a reservation where it was impossible for them to practice their traditional way of life. So each of these figures puts a searching microscope on the brutal realities of the human condition, which sets up my book’s central problem: the ethics of new beginnings after devastation. Third, each of them tries to offer a compelling ethics of new beginning in response to the picture of reality they describe. Can they make a plausible case that it is good to exist and that life in the world with others should be loved without exclusion? What is their solution, and what are the implications? I try to accurately reconstruct each of their unique but overlapping positions. Fourth, I argue that they can’t provide positive answers to my questions, and thus I turn to Bonhoeffer to see if he can. In short, then, these significant thinkers illustrate the enormity of the problem, a variety of secular responses to it, and also – so I argue – the need for another option. 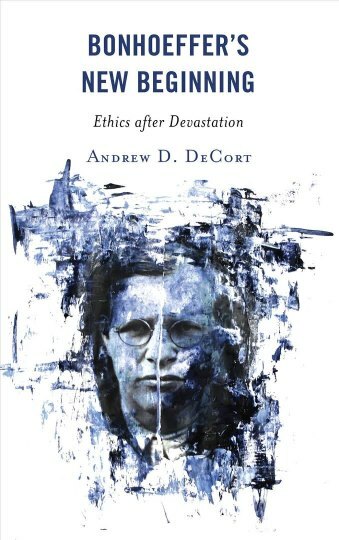 The rest of my book reconstructs Bonhoeffer’s ethics of new beginning and why I think it enables us to affirm that, yes, it is good to exist and, yes, life in the world with us should be loved. That is, I argue that Bonhoeffer’s ethics is capable of redeeming our overall interpretation of and commitment to reality as uniquely (im)moral creatures. AD: First, in the preface (entitled “Beginning”) to my book, I mention that I understand “devastation” not only as the destruction of our capacity to begin again but also the demoralization of our will to begin again. That is, we are radically devastated when we think not only that we can’t begin again but more fundamentally that we shouldn’t or that it is no longer worth trying, because existence is so atrocious and/or evil. In this sense, “devastation” is a double destruction of both our existential and ethical condition and very close to nihilistic despair, the undermining conviction that reality is morally empty, meaningless, and doomed to nothingness. What I try to argue in the first chapter of my book is that the practice of universal entry – intentionally making the mind a welcoming space for others in their suffering – is, in fact, devastating – unless a new beginning can be found that redeems its universal embrace of others in their devastation. (I call universal entry an exercise, because, like Nietzsche, I think most of us are terrified by reality, and thus confronting it requires an intentional, consistent, courageous practice. Otherwise, we remain in partial honesty and illusory optimism at best.) I write about “consciousness becoming an asylum of sufferers, a mourning tent, a burial ground for the dead and dying” within the practice of universal entry. And rather than dramatic exaggerations, each of these images describes ways that I have felt as I face the world and especially as I try to practice universal entry. So universal entry becomes the grounding – or really the unearthing – trial of the questions I ask: Is it good to exist? Should life in the world with others be loved without exclusion? And absent any obvious positive answers to these questions, it sets the problem to which my book tries to respond: if universal entry is what a good mind looks like (a mind that doesn’t blithely enjoy life based on ignoring or excluding others but welcomes all), and if universal entry is devastating, is it possible to be good and to still love life? Or does joy in life become, at best, a bitterly necessary evil and goodness, self-ruin? Q: According to Bonhoeffer, what (or perhaps we should ask who) is a new beginning and how exactly do new beginnings happen? AD: Thank you for reading my book carefully, which your question reveals. In the third chapter, I make the argument that Bonhoeffer thinks that humans are not capable of autonomously making new beginnings for ourselves. This is Bonhoeffer’s critical moral anthropology. In fact, Bonhoeffer believes that this drive to make ourselves anew goes to the core of what is wrong with us (“the fall”) and what ultimately devastates us. (The rhetoric of “new beginning” in Hitler and Nazism is fascinating and sobering.) Rather than receiving our lives and the world as God’s precious gifts born from nothing but love, we dis-grace creation and want to re-create it as our own. Thus, in Creation and Fall, Bonhoeffer calls the drive to possess and make the beginning a “satanic” temptation. In our age obsessed with novelty, innovation, “start ups,” and other forms of trying to make new beginnings (I think of Yuval Harari’s interesting work in Homo Deus), I’m convinced that Bonhoeffer’s critical analysis is extremely important. Through Bonhoefferian lenses, so much of what we identify and idolize as “new” – that which promises greater power and self-importance – is in fact desperately old and often disastrous. The paradox is that Bonhoeffer’s new beginning begins in an apparent ending: when we recognize and embrace that we ourselves are not capable of starting over by ourselves. This is why I argue at the end of chapter five and in the appendix that Bonhoeffer’s last recorded words – “This is for me the end, but also the beginning” – encapsulates his ethics of new beginning. Only when we surrender our drive to autonomously begin are we ready to begin anew. Moreover, Bonhoeffer thinks that the new beginning emerges precisely in the place of pain where we enter into the sufferings of others like Jesus describes in Matthew 25:31-46. (I haven’t done the numbers, but this must be one of the most quoted or alluded to passages of the Bible in Bonhoeffer’s corpus. Bonhoeffer repeatedly returned to this parable and insisted that we meet Christ himself in suffering others when we embrace them with love.) The devastation of universal entry has the potential, at least, to be a participation in the sufferings of Christ and thus redemptive. So new beginnings happen in this miraculous liberation from self to be with and for others in love “just like Christ loved us and gave himself up for us” (Ephesians 5:2). And, again, part of Bonhoeffer’s (often Luther-influenced) argument is that we cannot make this happen or fabricate this for ourselves. It is a gift that mysteriously happens to us through Christ’s grace. Having said that, I argue that Bonhoeffer also believes that Christ has given us practices of new beginning, which help rehabilitate our agency for new Christological beginnings – what he calls “paradoxically passive action.” More practices could be traced in his work, but I discuss six in some depth: (1) baptism; (2) prayer, intercession, and discernment; (3) repentance, confession, and forgiveness; (4) service, resistance, and suffering; (5) gratitude; and (6) witnessing God’s own practical promise of resurrection. To sum up: (1) Christ – in creation, incarnation, cross, and resurrection – is the new beginning. And (2) Christ is new precisely because he is the one who freely welcomes others as good gifts – those who never were before and needn’t have existed except for Christ’s self-transcending, self-giving love. And thus (3) we experience and embody Christ’s new-beginning power when we enter into his way of life and exist with and for others. That is, for Bonhoeffer, the human new beginning is a following after (Nachfolge or “discipleship”). In a profound sense, then, (4) each one of us is a/the new beginning when we live in self-transcending love, and this points to an extremely fascinating and repeated emphasis in Bonhoeffer that we can be “Christ for one another.” This takes us back to Matthew 25:31-46 and his interpretation of repentance, confession, and forgiveness: while we cannot replace Christ, Bonhoeffer thinks that we can “stand in the place of Christ” and forgive one another and thus give one another God’s own new beginning. I want to emphasize how novel Bonhoeffer’s position is precisely because it isn’t about novelty at all. Bonhoeffer’s critique of human-made new beginnings makes a lot of sense, because Bonhoeffer was living in a society whose leadership was making vaulting promises of newness, and yet they produced extermination camps and hell on earth. Thus, Bonhoeffer’s new beginning is not fundamentally or primarily about myself, my innovation, my enlargement, my new start – or my group’s. Bonhoeffer’s new beginning is about the other and their priority and a new community in which we love one another as ourselves. And this, again I believe, furnishes us with a powerful critique of and alternative concept to contemporary notions of newness, which so often are egocentric and even narcissistic. Certainly, Bonhoeffer would unequivocally argue – against the shameful distortions of Eric Metaxas – that Trump’s promise of a new, great-again-America is fundamentally old and perhaps even satanic, because of its pervasive narcissism and antichrist devaluation and exclusion of others. Bonhoeffer would be deeply alarmed by the populist, often racist animus of much contemporary politics. Q: Towards the end of the book, you write about “practices of new beginnings” in Bonhoeffer’s thought. What are some of the practices that Bonhoeffer identified as central to cultivating new beginnings after devastation? How do power and privilege trouble/impact these practices? AD: As I mentioned above, I try to unpack six practices (or nuclei of practices) in Bonhoeffer’s corpus. I am inspired and challenged by all of them, but let me mention a few. First, baptism is a once-enacted but ever-reenacted practice of dying, and only then being risen to a new beginning by Christ himself. Bonhoeffer thinks that the waters of baptism should wash us clean of nationalism, racism, classism, and the other divisions that belong to the “old world” and dis-gracefully attack Christ’s will for us to be with and for one another as God’s good gifts. Thus, for example, Bonhoeffer argues that baptism in antebellum America should have destroyed the institution of slavery and racism with it, because if the slaving “Christians” of America had truly taken their baptism seriously, they would have been dead to this dehumanizing system and seen their slaves as sisters and brothers, indeed, as embodiments of the suffering Christ himself (Matthew 25 again). The problem here is that baptism easily becomes a marker of (antichrist) Christian identity, which perversely endows the baptized with privilege in the identity group and power over others outside or beneath it. Here Bonhoeffer fiercely attacks the Nazified Christian idea that baptism did not equalize Germans and Jews as equal children of God. Second, prayer and especially intercession is a practice in which we voluntarily bear the weight of others’ pain and brokenness, bring them before God in our hearts, and ask God to bless and heal them. I love Bonhoeffer’s definition of blessing: “Despite everything, you belong to God.” It is evident how this practice would liberate a self-imprisoned ego to welcome, wait upon, and respond to others. For example, Bonhoeffer argues that it should be impossible for Christians to hate anyone, because Christians should actively pray for their enemies, and how is it possible to hate someone that you have patiently, persistently lifted up before the face of God for him to bless and heal them?! So prayer here is not exactly my “alone” or “private” time with God but rather a hidden practice in which I am surrounded by so many others in the presence of God, and my prejudices and animosities are abolished. But, like baptism, the danger of prayer is that it devolves into a privileged experience where it’s “just God and me,” others are forgotten, and I focus my attention on my desire for special favor above/against others. Third, Bonhoeffer roots his endorsement of political resistance in his practice of self-giving service for others. Bonhoeffer’s paradoxical insight here is that when a totalitarian government is dominating the weak and powerless, resisting that government and willingly suffering for doing so, if need be, is a form of participating in the suffering of Christ for powerless humanity. That is, rather than political resistance being a form of violent aggression, it becomes a paradoxical form of Christological ministry in which we embrace guilt and give ourselves for others’ liberation. (As an aside, I’m convinced that Bonhoeffer was never a pacifist in any simplistic sense. His July 1932 address “On the Theological Foundation of the Work of the World Alliance” is crucial on this matter.) I believe Bonhoeffer’s insight here is extremely important and must be (re)discovered by Christians around the world, especially those living in oppressive contexts like I do in Ethiopia where the church – like most of Bonhoeffer’s church – is all but silent and passive in the face of so many neighbors’ horrific destruction. Once again, the danger is that the church becomes a self-preserving entity in which there is “no risk-taking for others” and only exercises power for its own protection and privilege. The fifth chapter of my book on Bonhoeffer’s practices of new beginning is by far the longest, and I cannot summarize it here. But the essence of each practice is welcoming, waiting upon, and responding to others in love and thus abandoning and overcoming our entrenched drive to privilege ourselves. These are practices of learning how to be “humans for others” like Christ himself and thus they have Christological, sacramental significance, though Bonhoeffer doesn’t often use that language. Q: It seems that globally, we are desperately in need of new societal beginnings. Are social, collective, political, or structural new beginnings possible? And can we draw upon Bonhoeffer’s own life and political resistance as a resource or guide? AD: This is an urgently important question. My short answer is mostly no and hopefully yes. I say mostly no, because if we are not careful, this desperation will betray our lingering hubris and the conceit that we ourselves can make some messianic change in our societies and their governing structures. Bonhoeffer’s worry – and I think this is prescient – is that these structural programs all too easily claim and justify unlimited power, which is often a cloak for what Bonhoeffer called “the spirit of annihilation,” which leaves behind “fields of corpses.” Again, the Nazi promise of a new beginning for Germany and the “Arian race” is extremely sobering. So part of the paradoxical nature of the Christian work of new beginning must be the critique and challenging of our idols of new beginning. As I mentioned above, I think Trump’s slogan and the ideology behind “making America great again” merits serious Christian criticism. The American “new world” was also a place of conquest and genocide, which we conveniently forget. I also say hopefully yes, and Bonhoeffer insists that this must begin with repentance, confession, and forgiveness. That is, there is no real beginning without the grief and lamentation about the devastation that has been wrought. Thus, rather than the new beginning commencing with a sense of triumphal optimism and human possibility, it starts with a sober ownership and acknowledgement of our capacity to unleash terrible evil on one another. In fact, this is precisely what Bonhoeffer prophetically does in his Ethics. In the section on the Ten Commandments, rather than using these commands as benchmarks of the church’s holiness or even ideals for its approximation (“Christian culture”), he uses them as judgments that call for the church’s own naked confession of its complicity and indeed active role in the evil of the socio-political order. Thus, Bonhoeffer saw the church as a prophetic community amidst devastation, not because of its privileged holiness, but because of its leadership in confessing the damnamus against itself – the rejection of its own failure to follow in the way of Christ’s new beginning. Surely, for example, Bonhoeffer would call white Evangelicals in America to explicitly and boldly denounce its racist past and seek forgiveness among our African-American sisters and brothers, something that has never played in any role in the churches with which I am familiar. Nevertheless, I think Bonhoeffer would soberly caution us against any form of optimism about sudden or systematic change. We find our best hope for new beginnings when (1) we recognize that we desperately need a new beginning and (2) we begin by confessing that we don’t have the autonomous knowledge or power to make it happen and thus that (3) we are radically dependent on a power that transcends ourselves (to speak in a secular idiom) and one another across boundaries as neighbors who will be fallible until death but still filled with hope now and then. Q: Perhaps this question may be too much of an attempt to psychoanalyze Dietrich Bonhoeffer the person, but does he have his own “new beginning” at some point in his life? One thing I am convinced of, however, is that there is almost nothing “new” in Bonhoeffer’s prison writings. I believe one could document precedents for almost all of Bonhoeffer’s statements and formulations in his earliest work. “Religionless Christianity” was certainly not some kind of novel discovery, much less a “new beginning” or departure in his thought. He says this explicitly, and any reader of his early work knows this. Bonhoeffer’s prison theology intensified and sharpened his earliest convictions. Something I would like to discover is when Bonhoeffer first read and/or encountered Matthew 25:31-46. He starts quoting or alluding to it as early as 1926 when he was twenty, and I am convinced that it was one of the keys to his life and thought. From very early on, this very privileged young man became convinced that God is especially near to and found among – found in – the poor and powerless, the condemned and outcasted. (See pp. 214-215 of my book for a montage of references.) This is one of the things that most impresses me about Bonhoeffer: he did not live his life trying to cement the status of people like himself but gave his life writing, ministering, and fighting for people so unlike himself. When and how did this begin? Regarding psychoanalysis, some scholars have asked whether Bonhoeffer had romantic feelings for his best friend Eberhard Bethge. I don’t have a strong opinion but a tensioned observation. On the one hand, some of Bonhoeffer’s personal letters to Bethge evince an affection and odd possessiveness that could be interpreted in this direction. On the other hand, Bonhoeffer’s engagement with Maria strikes me as very passionate and real. It is interesting to note that in one of the later volumes of Bonhoeffer’s Works, there is a footnote in which the editor says that some sensitive material has been cut out. I have asked several Bonhoeffer scholars about this singular footnote, but most of them hadn’t noticed it or don’t know what is behind it. From Bonhoeffer’s own theological perspective, perhaps the most profound new beginning in his life was his death. As a believer in the resurrection, I hope to meet Dietrich Bonhoeffer in what he called “the new world of the resurrection” when God gives us the most radical gift of new beginning after everything has fallen apart. Q: Now that Bonhoeffer’s New Beginning has been published, what are you working on? AD: I have sketchy outlines of thirteen books I’d like to work on before I turn forty. The first is called What Is Christianity? Presence, Practice, and Protest. Its root claims are (1) that the Christian God is the lover of the nothing (creation), the enemy (Christ), and the dead (resurrection), and (2) that the Christian life is meant to be lived as the practice of this God’s presence in our world, and (3) that doing so serves as an embodied protest to the forces of devaluation, hatred, and violence in our communities. Another book project I’m outlining is a study of the Book of Ruth as an overlooked but provocative source for Christian ethics today. I see Boaz as the Bible’s first paradoxically biblical dissident. While Deuteronomy and so many other texts insist that Moabites must never be included in the community of Israel, Boaz gives his hesed – his covenantal, divine love – to the officially forbidden Moabitess Ruth. In that scandalous way, Boaz helps give birth to the messiah Jesus, which Matthew highlights on the first page of his Gospel. Boaz is the embodiment of God’s faithful love by being unfaithful to the Mosaic Law precisely through his faithful love for a condemned, cursed outsider. So how should this biblical book help us reimagine Christian ethics and Christian community today? In the coming months, I hope to film an online video course tentatively called Neighbor-Love: A Biblical Idea that Could Save the World, which will accessibly unpack my research on neighbor-love in Christian thought and history. Arendt once said that most thinkers only truly work on one thought in their lives, and if mine is not beginnings, it is neighbor-love. (1) What does it mean and require to love all others as ourselves, in light of Jesus’s universalization of the “neighbor,” including the enemy? (2) How can we cultivate the practice of neighbor-love in our character and ordinary lives? (3) And how can neighbor-love become central to our churches’ and societies’ ideals and initiatives? Whether it’s racism in America or ethnocentrism in Ethiopia, we urgently need to see the other person as our neighbor, someone we are commanded – and gifted! – by God to love and care for. I firmly believe that neighbor-love could save us from so much devastation and hell. Jesus centralized neighbor-love in his preaching and practice, but I fear that many of our communities have neutered, neglected, or completely lost this revolutionary idea. It is our time’s crucial new beginning. Getting back to Bonhoeffer directly, I would love to find time to write a compact monograph on Bonhoeffer’s use of Matthew 25:31-46 and his repeated, rich, and revolutionary claim that we meet Christ in others. In a 1928 sermon, Bonhoeffer declared, “‘Just as you did it to one of the least of these, you did it to me,’ Jesus says. I am for you, and you are for me God’s claim, God himself; in this recognition, our gaze opens to the fullness of divine life in the world.” I’ve collected 30,000 words of similar statements from Bonhoeffer’s corpus. How did Bonhoeffer come to believe this? How should we interpret and evaluate it? And what are its ethical implications for our belief and behavior today? Thank you again for your interest in my work! It’s a special gift.